Whilst it may be possible to argue that Anna Bligh does not have all of Peter Beattie's serious flaws, the article Anna's Independence Day seems to overlook a whole range of hugely controversial and unpopular pro-big-business policies of Anna Bligh and her government. Some are clearly Bligh's own initiatives, whilst many others are continuations of Beattie's policies. In spite of the fact that 79% of the Queensland public oppose privatisation, 66% would support industrial action to stop the Bligh Government's $15 billion fire sale and many union members have expressed a willingness to strike, the Queensland unions have failed to take the only action that could possibly cause the Queensland Government to change its mind. If Queensland's current runaway population growth continues, further encroachments upon the habitat of our endangered iconic koala are inevitible, practically guaranteeing their extinction in South East Queensland. Yet Premier Anna Bligh, by having renamed the 'population summit' to the 'Growth Summit', has told Queenslanders she is no longer interested in considering the one chance we have to save our koala, that is, population stability. Protest to save our koala: Rally outside the main entrance of Queensland State Library, Southbank, Brisbane at 11.00am Tuesday 30th March 2010. The Bligh Government has arrogantly proceeded with its privatisation plans despite over 80% of Queenslanders opposing the decision. What you can do: Attend the protest at Brisbane's Roma Street Forum at 10:30AM on Tues 9 March. See also: the Queensland Council of Union's "Queensland Not for Sale" campaign site, saveourpublicassets.org, "Labor wrecker of 2007 claims union anti-privatisation campaign a threat to re-election of federal Labor" of 28 Feb 10. The Queensland government plans to move koalas from a site earmarked for residential development. To where in South East Queensland, with ever more of its bushland being bulldozed by the Labor Government's developer benefactors, and how the dislocated koalas can be expected to survive, let alone thrive, is unclear. What you can do: Contact Premier Anna Bligh at premiers [ AT ] ministerial.qld.gov.au or Kate Jones the Qld Minister for 'Sustainability' at sustainability [ AT ] ministerial.qld.gov.au and demand they end the relocation. See also: www.savethekoala.com, Conservationist says Narangba koala relocation a death warrant ("Anger at koala 'final solution'" in printed version) in the Courier-Mail of 19 Feb 10. Is it any wonder people who care about the world feel disempowered and ineffective when they wait months for a reply from a politician and, if they get one at all, find it is a form letter that fails to address the concerns they raised? How can you and I make a difference when our leaders aren't listening to us? Do we become apathetic and give up or do we try new tactics? This is an ongoing blog that I invite you to contribute to by way of reply. Perhaps together we can find what does work, if anything. It's our future - if we let the corporations and leaders who are corrupted by them call the shots, we won't have one. ‘Water, water everywhere but not a drop to drink;’ Thus spoke the Ancient Mariner in the 18th century. A recent report warns that without global action, demand for water in 2030 will outstrip supply by 40 per cent. Ray Brown, Mayor of the outback Queensland town of Dalby, says the town's in real danger of running out of water and restrictions may be increased to their highest level if the situation doesn't improve. Dam levels in Toowoomba, Queensland's biggest inland city, are down to 8.5 per cent. Kangaroo Meat Export - ban it and follow the European Parliament's lead on fur seal products! On 5th May 2009, Members of the European Parliament voted in favour of adopting strict conditions for the placing on the market of seal products in the European Union. The way kangaroo joeys are slaughtered by 'professionals' is comparable to that still inflicted on Canadian fur seal pups. Australian poaching of its wildlife places it culturally backward in the 19th Century. Australian society needs to wake up to what is happening outback and call for immediately bans on wildlife killing including banning the State-sanctioned industrial poaching of kangaroos. 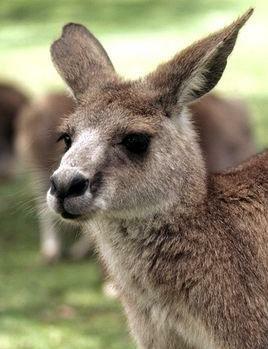 The so-called kangaroo 'industry' is no different to the fur seal 'industry'. They are each shameful practices of immoral brutality. Read more about Kangaroo Meat Export - ban it and follow the European Parliament's lead on fur seal products! Tell Anna Bligh to get her hands off OUR public assets! See also saveourpublicassets.org and online discussion forums: "Out of the mainstream" of 7 Nov 09 and "Bligh’s bad arguments for privatisation" of 29 Oct 09 on johnquiggin.com, "Quiggin on Bligh’s arguments for privatisation" of 09 on Larvatus Prodeo. On 24 August, Queensland Premier announced plans to conduct a 4 day tour to convince the Queensland public of the necessity of her AU$15 billion public asset fires sale. This, she insists, is necessary to pay for the building projects which she claims are necessary to keep Queensland's economy moving. However, as Peter Simpson, Queensland Electrical Trades Union branch secretary pointed out, thr Premier has kept the tour itinerary secret. Also published on Save Our Public Assets. See also: Bligh defends asset sales, works program by David Barbeler in the Brisbane Times of 24 Aug 09, Anna Bligh to tour state projects in defence of asset sales by Steven Wardill in the Courier Mail of 25 Aug 09, Bligh begins whirlwind tour to justify asset sales by Chris O'Brien on the ABC on 25 Aug 09. In an article in the Christian Science Monitor Joseph Chamie, former director of the population division of the United Nations labels the notion that population growth is a boon for prosperity as "Ponzi Demography". In Australia, confirmation of this has come from none other than the population-growth-pushing and public asset fire saleswoman, Queensland Premier Anna Bligh. See also: "How the growth lobby threatens Australia's future" of 24 Jan 09 republished on Online Opinion, "Is population growth a Ponzi scheme?" in the Christian Science Monitor of 17 Aug 09 by David R. Franks. Original article by Paul Benedek published on saveourpublicassets.org. See also: Stop Thief! Rally on 15 August to stop theft of Queensland's public assets. Dorothy Pratt, Independent member for Nanango, exposes the deceit and shortsightedness of the Queensland Government's asset fire sale, announced not during the election campaign concluded on 21 March, but only only eight weeks afterwards. See also: Dorothy Pratt's web-site at pratt-mp.webs.com. James Sinnamon, who stood as an independent candidate in the 2009 Queensland state elections, put to Queensland Premier Anna Bligh that as she denied the Queensland public their democratic right to settle the issue of privatisation at the recent elections, in spite of his own hard efforts to draw her attention to the issue, that she either withdraw her privatisation plans, or put the issue to a referendum. See also: Queensland Government has no mandate to privatise of 27 May 09,"Open letter to Anna Bligh and Andrew Fraser asking that any planned privatisations be put to the public at forthcoming elections" of 17 Feb 09, "Brisbane's local ABC radio fails to hold Anna Bligh to account over privatisation" of 28 May 09, "Brisbane ABC suppresses alternative candidates in state elections despite listener dismay with major parties" of 30 Apr 09. Courier Mail Readers comments about privatisation, 299 so far, nearly all opposed. Attend protests against privatisation outside the state Labor Party conference this Queen's Birthday weekend including a protest organised by the ETU for Sunday at 11am. Postscript: 'Reply' of 16 Jun 09 from Premier Anna Bligh. Update (5 June 09): Anna Bligh's own Labor Party branch votes unanimously for her expulsion.. See story in the Courier Mail.